The Fabricast DBB FIG 145-UHMW, 40-MM, and 50-PS are highly engineered, high performance, double gated polymer lined knife gate valves. Serves as both a double block and bleed valve and a line blind. 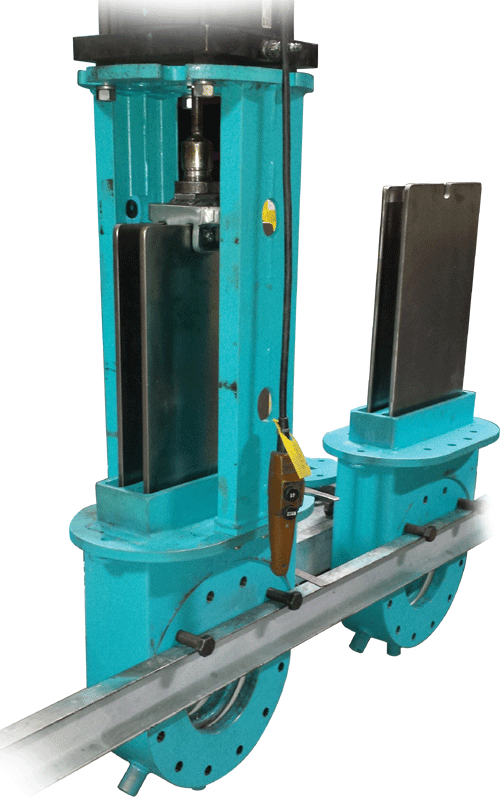 Designed and tested to MSS SP61 and ASME B16.5 Specifications. 304 Stainless Steel fixed liner retaining rings are standard full port design, or can be made to match any pipeline I.D. ASTM A240 Dual 304 Stainless Steel gates fully machined and surface ground. All edges are chamfered to extend packing life and to provide a superior atmospheric seal. Mechanical lockouts are standard – manual and actuated valves. Braided Teflon synthetic packing is standard 3-11 PH rating. Locking fasteners are standard on all Fabricast valves. Liners/insert – Polyurethane 180 Deg F, Polypropylene 225 Deg F, High Temperature UHMWPE 280 Deg F, Teflon 400 Deg F, Other – Contact Factory.